If you are looking for a creative way to show a repeating process then you’ve come to the right place. 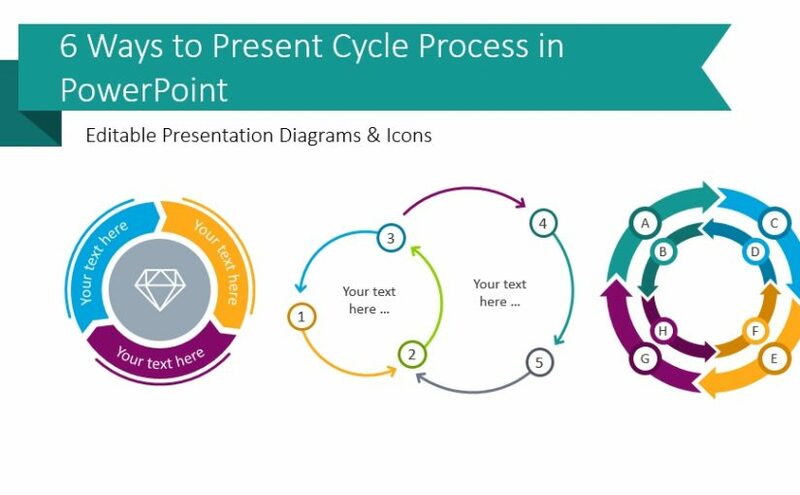 Below we’re presenting a few modern ways to use cycle diagrams on a PowerPoint slide. Circular processes are flowcharts expressing a recurring set of events. With a few design tricks, you can create simple infographics that will make your presentation look professional. The diagrams with cycle arrows that you will see contain various numbers of steps or levels, and they can be illustrated with icons or have a minimalistic outline flow chart look. 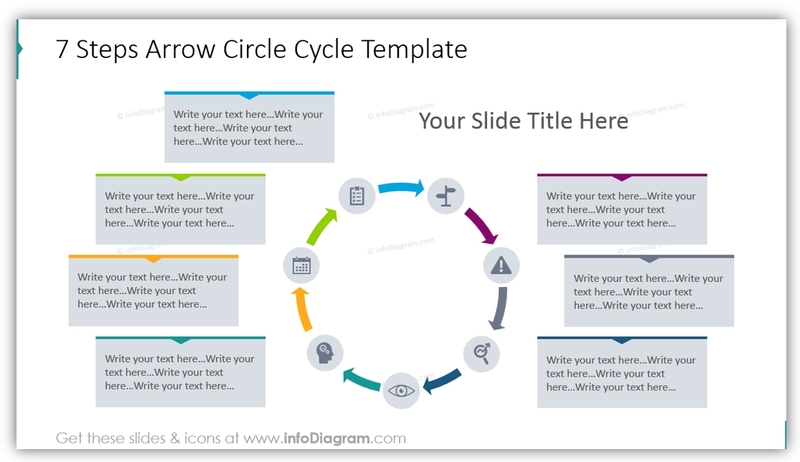 All example slides can be found in Cycle Diagrams & Wheel Charts PPT collection. 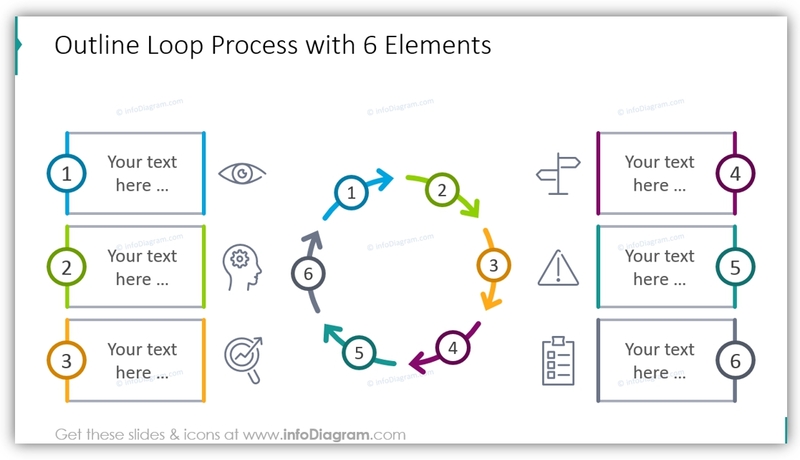 We’ve put together a bunch of cycle diagram examples to show a continuing sequence of tasks, stages or events in a circular flow. Here we used a six stage-loop as an example. Each stage is illustrated with various color and icon so it’s easier to distinguish them one from another. This is a minimalistic kind of cycle, it will suit you if you don’t need to put many descriptions around. 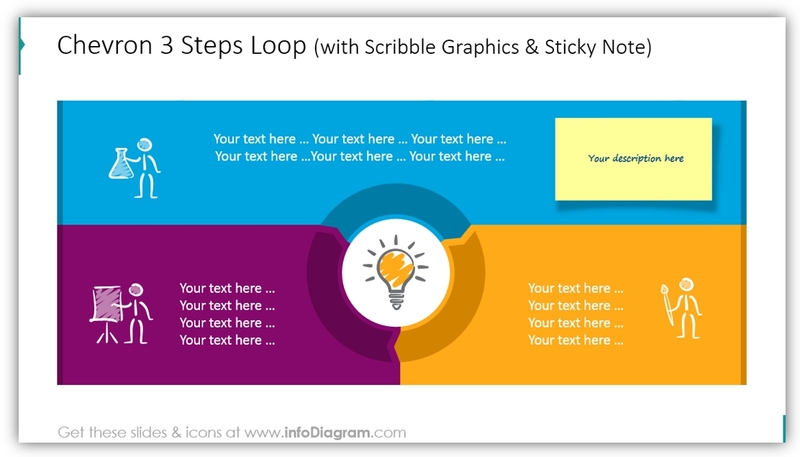 Design tip: To keep your slide content readable, we suggest putting up to 6 or 7 stages on one chart. If you need to include more, use a second chart or create another level on the same slide. Even though there are seven stages, the slide still looks decluttered. This is because we put symbols instead of numbers in the wheel and saved a place for the description of each step. 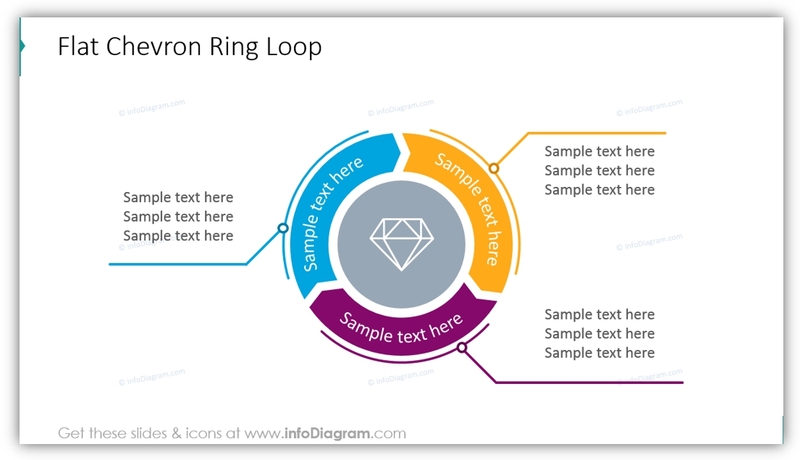 In the next example, we used chevron arrows and a big icon of a diamond in the loop center. The diamond symbolizes the added value. The simple line call-outs give a modern look to the slide overall. If you need a different number of stages, you’ll find those at the end of the Cycles slide-deck. We have included similar loops with various numbers of stages. 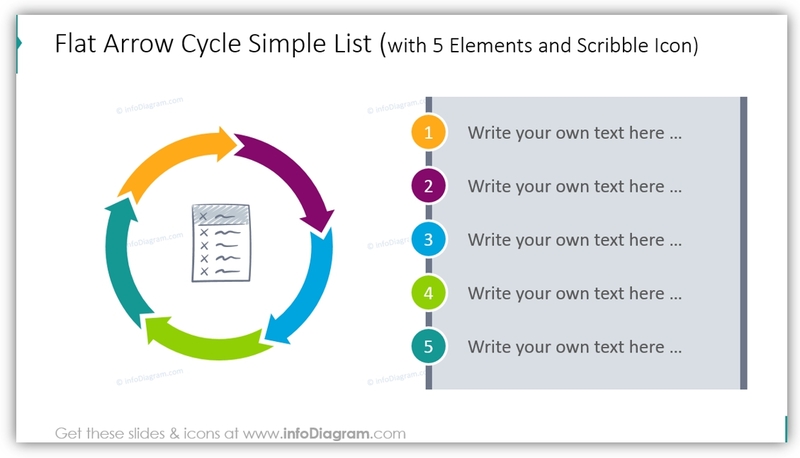 If the cycle you want to present can be associated with a list, the following template is just for you. It’s a clean wheel chart with a numbered list legend on the side. Two-level cycles such as this are good to use when you want to explain a more complex topic with embedded cyclic processes. 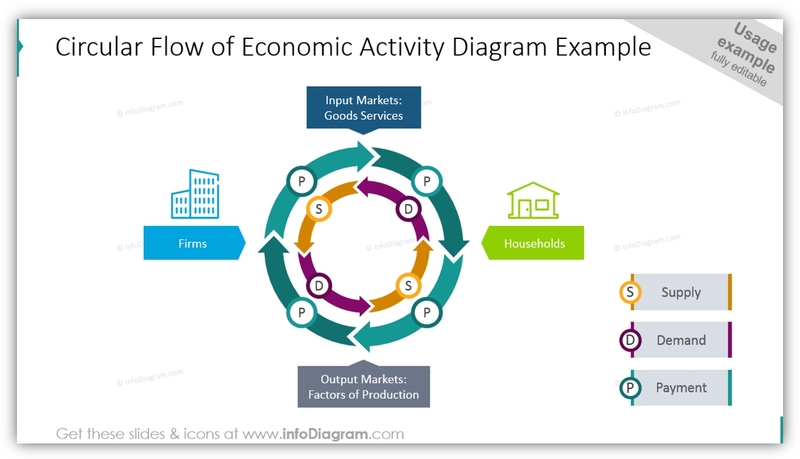 For example, a flow of economic activity as shown here. We suggest illustrating key categories with simple text and outlined pictograms, paint arrows in different colors expressing various things. Explain your symbols, pictograms, and colors in a legend on the side. 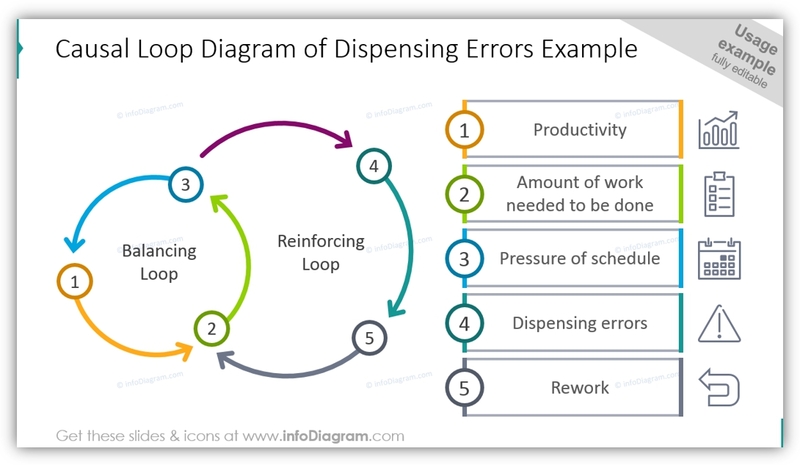 If you need to present two cycles that are interconnected, see the following example. There’s no need to create separate slides, you can show them with outline arrows and short descriptions with icons. Use simple design styles – flat filling, light or no outlines. Avoid old looking gradients or 3D effects. Don’t overload slide with a text. Only write keywords, leave the details for your speech or for notes. Be consistent in styles, use one color palette, 1-2 fonts, and one style of icons. Don’t overdo it with decorations. A simple color line will do, as you saw on the slides above. Remember to have big enough margins. Don’t put your presentation elements (text, diagrams, icons) too close to the slide edge. We hope our blog gave you some inspiration 🙂 You can recreate such cycles from the examples above or get ready-to-use PPT slides. If you like the slides above, you can download the package we designed (or subscribe and get slides every month for your needs). 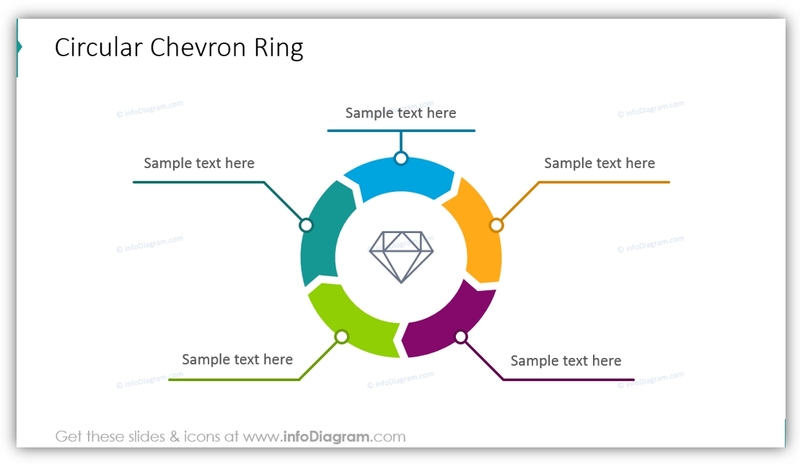 Should you need help with choosing or using our PowerPoint graphics, let us know here. We will gladly assist you.